Half of 2015 is past. The highlights are yet to come. Celebrate the last half–the BEST HALF–of summer at Lake Panorama. Pardon us if we write too much about safety. We never want safety to be taken for granted, whether while participating in water contact recreation, playing golf, riding bikes, working in the yard, or whatever activity one finds oneself doing. Boating safety is of particular importance. Navigation buoys are the principal means of communicating traffic related rules at the lake. The traffic pattern (the counter-clockwise boating) in the narrow portion of the lake is critically important for safe boat operation. This long-established pattern focuses on using the center-line buoys that mark the middle of the channel as “keep right” buoys. Be sure vessel operators are familiar with this important fact. Those buoys are what keeps traffic in its own lane and helps to avoid what could otherwise be collision chaos. The only large area where the pattern does not apply is in the main basin, that portion of the lake essentially visible from State Highway 4. Towing Restrictions–There is one area of the lake, affectionately referred to as “the Narrows” that truly is a narrow stretch of water. Beginning Memorial Day weekend this year, that section has special buoys indicating the area that towing activities (skiing, tubing, wake-boarding, knee-boarding, and wake-surfing) are prohibited between the hours of 11 a.m. and 4 p.m. on holidays and weekends (holidays this year include July 3 and September 7.) This area is simply too crowded for safe operation of towing activities during these hours. Watch for the flagged buoys that mark each end of the Narrows. Hazard buoys mean what they say. The buoys are located near underwater objects–rocks, shallows, reefs, etc.–that can take off a propeller or a lower unit. If the buoy says hazard…avoid it or avoid the area. Speed Limit buoys– The lake has two speed limit buoy types–those that say 10 mph limit and those that say “no wake.” These are meant to regulate speed in Lake Panorama Cove areas–to slow boats from creating high wakes or to completely reduce wake in the far upper end of each cove. These limits have been established for years and have worked fairly well. Night Travel–The Lake has a 10 mph speed limit at night. 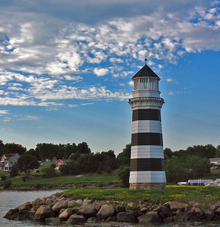 Although the center-line buoys have navigation lights that flash at regular intervals, provided they have not suffered storm or other damage, there are no other lights marking lake features except the beacon in the lighthouse at the Marina jetty. Vessels are to follow safety rules regarding nighttime operation, need to have their proper running lights on after sunset and, if to be operated safely, need to have an experienced driver, who familiar with the lake’s traffic pattern and coves, behind the wheel. Sailing–sailing isn’t prohibited at Lake Panorama, but with the traffic regulations, it can be very difficult to do safely. We only have a couple of registered sailcraft on the lake, who are well aware of the issues. Canoes, kayaks, paddleboats, paddleboards—these slow moving craft must keep toward shore during busy boating hours and may be asked to move to a safe location away from motorboat and personal watercraft operation during busy days. Its for the safety of all. There are many, many more hours of quiet waters in early mornings and evenings almost every day and even quiet weekdays where these activities are welcome and much more enjoyable. Timing is everything. All coves are suitable for paddlecrafts at all times due to the speed limits already imposed in those areas. Since Lake Panorama, by law, is subject to the Iowa boating regulations as well as further restrictions and limitations imposed by the LPA, be sure every vessel has personal flotation devices appropriate and approved for use for each and every passenger. Be sure operators are familiar with boating rules and etiquette, best achieved by passing the online boating safety course available through the Iowa DNR. Observers are required for towing activities. Every boat has a capacity limit that must not be exceeded. In Iowa, every passenger counts, no matter what size they are. One issue that is seldom violated, but important, is that persons being towed count as passengers even though they are not in the boat, since they may have to be in the boat at any given time. LPA rules are also more restrictive on personal watercraft (jet skis, waverunners). Operators must be at least 16, and if under 18, must have a certificate showing they have taken and passed the boater safety course through the Iowa DNR. Enjoy the rest of the summer…looking toward Panorama Days, the first weekend of August, and for every other summer day’s enjoyment. Be careful and have fun…. As mid summer has arrived and the days begin to shorten again, it’s just time to comment about other ways for LPA members and guests to stay safe. Our last post concerned safety on the water. On that note, the restrictions on towing and wakesurfing will go into effect on Friday, July 3 through Sunday, July 5. Between the hours of 11 a.m. and 4 p.m, no towing of skiers, wakeboards, tubes, other devices and no wake surfing will be allowed in the Narrows area which is the passage between the upper basin and the main lake just upstream from Sunset Beach. Beware of Electrical Dangers! Members with electric-powered boat lifts, lights or outlets on docks should have an electrician check the wiring for safety. DO NOT USE EXTENSION CORDS to power electrical devices on docks. All wiring should be in properly installed conduit, not out in the open. Why? An electrical short can paralyze swimmers near the docks and cause drowning. Shocks can also be received by improperly insulated or exposed wiring that could cause stunned falls and injury. Licensed electricians should be the ones checking and upgrading your electricity near the water. Fireworks– It is illegal to have fireworks displays without a Guthrie County permit issued by the Guthrie County Supervisors. A display should have safety equipment on hand and prohibit inexperienced handlers and children from the launch area. Fireworks are not only dangerous to oneself, but to anyone within range of the launching and explosions. Golf Carts–Only licensed driver’s are legal golf cart drivers on LPA roads. Yes, it’s tempting to have kids drive while Grandpa sits along side, but this is not legal here. Similar situations have resulted in serious close-calls with young drivers panicking and almost causing crashes. The curves, hills, and numerous driveways offer lots of risky encounters for inexperienced drivers. Four-Wheelers–LPA rules permit 4-wheelers or ATV’s on LPA roads, but only when driven by licensed drivers and only while doing maintenance activities such as hauling brush or leaves. Four-wheel ATV’s can be driven on one’s own lot for recreation as long as noise concerns don’t bother the neighbors. Operation on LPA property or non-owned property is prohibited. Walking on the Street–There are no formal walking paths on the east side of the lake, although there are some woodland trails that are found north of the Panorama West Golf Course. If you must walk on the street, walk on the left, facing traffic. We don’t recommend walking on the streets after dark since there are no street lights in the community. Please prohibit children from riding bikes, battery operated vehicles, or operating radio controlled cars on LPA streets. Many guests are unfamiliar with the streets and will not be looking for children. The Raccoon River Bike Trail is only a few hundred feet east of State Highway 4 and is a great place for kids to bike with their parents or older siblings and friends. Mowing–Lots of steep lots–Be sure to only use mowers with roll-over protection and wear your seat belt while operating on steep yards. Better yet, leave it to professional lawn maintenance people. Be especially careful when dew is on the grass as it may be difficult to stop on steep, wet slopes. Visibility–Plants grow fast in the early summer and can obscure visibility by driveways. Please trim them back so you have plenty of sight distance as you leave your property. Curves and hills often obscure your presence as well. Take time to be safe. Food Safety–Another item often neglected is outdoor food safety. Warm temperatures can cause bacteria growth in picnic fare, lunches on the boat or even in the home. Use recommended techniques to keep food properly hot or properly cool. Ticks and Mosquitoes–These common pests aren’t always a danger but there is risk of disease transmitted by these critters. Wear long-sleeved clothing in the evenings, use recommended repellents (at recommended rates), or other measures to ward off biting insects and ticks. Poison Ivy is always a threat to some individuals who are susceptible to it’s ability to cause serious rashes, burning and itching. Check out the internet to identify this three leaved, irregularly notched leaves and growing character that can be seen as a bush, a vine on trees, or even as a ground cover. Another plant, wild parsnip, has flat headed clusters of yellowish flowers and a “celery” like stalks and leaves. While exposure to the plant sap of the wild parsnip does not immediately cause issues, the sap, when exposed to sunlight on the skin, will cause nasty, water filled blisters and scarring that may last several years. If you are exposed, get it washed off immediately and avoid the consequences. Sunburn–A doubly dangerous situation arises with sunlight and sunlight reflected off the water. Use sunscreen to protect and to avoid dangerous burns. Water contamination–A reality is that heavy rains bring high levels of coliform bacteria into reservoirs and lakes all over the Midwest. To avoid potential harm, never ingest lake water, always bathe after water contact recreation and especially prior to eating, and don’t go into contaminated waters if you have unhealed wounds or a pre-existing condition causing low immunity. Babies and the elderly are more vulnerable to disease causing organisms in the water. Although instances are very rare, it pays to be cautious. The LPA website will have information about bacteria tests taken every week through the summer season. Look for signs posted at each LPA swimming beach. Stay hydrated! In the heat of summer, even in the water, many can lose water through perspiration and activity. It’s wise to drink plenty of liquids and avoid caffeinated and alcoholic beverages when on the water in the heat. Many sport drinks are an easy way to stay hydrated and avoid potential overheating, fatigue, and disorientation. Have fun, but be careful! This whole list may sound worse than it is, but it just means that there are things to look out for that may help you have a much more enjoyable summer.We want you to be able to enjoy your time at this beautiful place and remember it fondly when, and if, you are headed back to your permanent home. Most accidents are preventable. Have a Safe Boating Summer! As the summer season begins, we look for another safe year at the lake. Safety begins with preparation. Here’s a list of some things that may help this be a safe summer for you and your family. Safe Boating–First, a reminder that the Narrows will be closed to all towing and wakesurfing activities on weekends and designated holidays from 11 a.m. to 4 p.m. extending from May 23 through September 7. Memorial Day, July 3, and Labor Day are the holidays the rule will be in effect. This change should help reduce chances for accidents in this narrow area of the lake. Numbers in the boat–be sure your vessel only has the number of people in it that are authorized by the size of the vessel. Children count the same as adults in Iowa. Anyone being towed or wakesurfing also counts as an occupant of the vessel. The most frequent violators are PWC pulling a tube and forgetting the tube rider is an occupant. Personal flotation devices (PFD) for all-Every occupant of the vessel must have a PFD that is size-rated to fit them available. All children under 12 must have the PFD on while the boat is under way. Swimming in the lake–be sure that swimmers at LPA areas are within the swim areas marked by the floating ropes. Swimming around the docks is prohibited and particularly dangerous when traffic is busy, wake is high, and visibility of swimmers may be questionable. No swimming or diving is allowed from beach docks. Swimming in the main lake is meant to be within 10 feet of the vessel. Swimming in front of private homes should always be within 50 feet of shore to avoid boat traffic. It’s always best to stay inside the area indicated by the furthest extension of the local docks. Reckless PWC operation is not allowed. For obvious reasons–narrow traffic lanes, high traffic, visibility issues and the potential for accident is high. Navigational buoys have the force of rules. The buoys are the rules on the water and violators will be fined. The same “three strikes and you’re out” rule exists as it has for years. Three violations loses a member’s boating privileges for all the vessels involved. Boating under the influence–The Iowa DNR law enforcement does patrol the lake and has been vigorous in enforcement of this important rule. Don’t take chances. Unimpaired boat operation is important. Designated operators are commended. Observers are needed for towing and wake-surfing. There needs to be an observer in all vessels to watch for those being towed or surfing. Watch for quick turnarounds. The LPA recommends using the red flag to wave when vessels pursue downed skiers, tubers, or wake riders. Always watch for other skiers, wakeboarders and tubers that may have gone down. Speed limits after sunset are for a reason. There are hazard areas, docks, and other items that may not be easily visible. More than one incident has occurred in recent years of higher speed collisions with objects after dark. When the warm, beautiful days arrive, the sleeping office phones go crazy with requests, questions, inquiries, and more. Here’s a list of events and some reminders for LPA members. Don’t miss checking our website, also. 1. The annual meeting is Saturday, May 9, at 10 a.m. at the Lake Panorama National Conference Center. Members may turn in their ballots for board of director candidates by mail (they must be turned in with the numbered envelope sent in the annual meeting mailing (if it gets lost, call the office for instructions at (641) 755-2301.) Vote for no more than two candidates for the two open seats. It’s best to mail your ballots but they can be brought to the annual meeting and will be counted if they are submitted prior to the closing of the ballot which is early in the proceedings. 2. The Fin and Feather Banquet is the evening of May 9 at the LPN. Check out the ticket order and information by clicking here. 3. Early Season Boating–The navigation buoys have been placed. The hazard buoys mean just what they say. Traveling at at any speed close to these buoys is hazardous to propellers and lower units. The buoys have the force of rules. 4. New boating rule–The area of the Narrows (above Sunset Beach and below the far Upper Basin) will be closed to all towing activities on holidays and weekends from 11 a.m. to 4 p.m. from Memorial Day through Labor Day…This is a new safety rule for the narrow area and includes no wake surfing as well as no skiing, tubing or wakeboarding. 5. The upper basin is currently closed to recreational boating due to the dredging going on there until Memorial Day. Stay out of the area unless you own property there and have a dock or lift. Floating and submerged dredge pipe and equipment is hazardous to any boat and must be respected. Locals must operate their vessel slowly in this area. 6. Don’t forget to renew your fishing license. It is required for fishing in Lake Panorama, whether in a boat or from on shore. All Iowa fishing laws are in effect and are enforced by conservation officers. 7. Emerald Ash Borer has been discovered in southeast Dallas County. We recommend members to determine if white or green ash species (not Mountain ash which is a different plant family) are on lake property and decide how valuable these are and whether to remove or plan on future replacement. Treatment won’t be recommended until a known infestation occurs within 15 miles of the lake. 8. Road Repairs are beginning at the Lake. Watch for road construction and repair activities and slow down for workers. Work zones will be marked by signs. Work will only be taking place during weekdays, but some areas may be marked on weekends and should be driven with caution. 9. Invasive species stickers–To launch on the lake in 2015, every vessel must have an invasive species sticker. Members who have applied for boat permits and designated their boats will remain or only operate on Lake Panorama (RESIDENT BOATS) have been issued green invasive species stickers which should be placed alongside their 2015 boat permit as instructed with the permits. Members who designated their vessel will boat on other water bodies (NON-RESIDENT VESSELS) will be issued RED invasive species stickers upon reporting to LPA Security prior to their first launch. Every boat traveling to another water body must report to Security for inspection prior to re-launching at Lake Panorama. All vessels must be clean, drained and dry (for at least 5 days) after launching at another lake, river, or other water body. Another winter has passed and life is returning to the Lake Panorama landscape. Yard waste–twigs, leaves, branches, and anything else that grows on your property and needs to be disposed of can be taken to one of the two yard waste (brush dump) facilities–one on each side of the lake. The yard waste sites are open Wednesdays through Sundays from 9 a.m. to 7 p.m. We close them on Mondays and Tuesdays for managed burning and other work that needs to be done. The yard waste sites can take anything that grows on your property except root balls, stumps, and logs greater than 12 inches in diameter. The rules of the site prohibit the disposal of construction debris (including untreated lumber), trash, garbage, and other items, whether the items are burnable or not. Soft items (1/4 inch and smaller wood, grass, leaves, etc) are to be put in the compost areas and all the woody material greater than 1/4 inch in diameter should go in the burn piles. LPA members can burn leaves on their own property, but must supervise the fire and be considerate of neighbors concerning smoke. Do not burn on windy days or immediately prior to potential wind changes. If that Iowa DNR required dock sign got damaged or lost over the winter, another one can be ordered from the LPA for $20, if picked up at the office. The signs can be mailed for about $5. If you are planning building projects, landscaping projects, shoreline work, dock installation, or just about any other project outside of your home, please contact the office to see if the project requires a permit. Land disturbing permits are needed for new driveways, ditch filling requests (not always allowed), work within 100 feet of the lake and for any land disturbance of over 1,000 square feet. Those permits are free. Building permits are needed for most construction projects. You can get a checklist of requirements for building permits by clicking here. The Annual Meeting is Saturday, May 9, at 10 a.m. at the Lake Panorama National Conference Center. Every member is invited and mailings will be sent the week of April 20. The ballot for board of directors will be included. Gentle reminder–all vehicles that are outside must be currently licensed and in operating condition. Never hesitate to call the office if you have questions. We may not know the answer right now, but we can find it. Watch for the General Manager’s coffees at the Conference Center. The first is Friday, April 3, at 10:30 a.m. and will cover the Rural Improvement Zone legislation that is working its way through the legislature. Enjoy the beauty of spring at Lake Panorama! One can’t help thinking of spring with temperatures rising to the 50’s and most all of the snow from early in the month melted away. Despite the calendar’s statement of late January, actual spring may be a long way off yet. Warm temperatures do mean, however, that the LPA may have to put an embargo in place on lake streets. All but about one mile of our streets are chip-seal. That means that the street surface has asphalt oil and chips that “seal” the surface and make it dustproof. The base that is under that seal is not cemented together by asphalt as it would be in a hot mix asphalt street or in a street made of concrete. The weight bearing base of our streets is a layer of crushed limestone. A limestone base makes a fine weight bearing layer, except during periods when there is lots of soil moisture and particularly when the ground is thawing. Instead of rock layers supporting each other as they intermingle, there is a high amount of water in the road base and the liquid content takes away the supporting strength by allowing the rocks to move and slip past one another.. This means that heavy loads will not be adequately held up by the base and the weight of vehicles may actually break through the chip/seal surface causing costly repairs and “wrecked” roads. So–Be aware that we may have to put on an embargo which will be a weight limit of 5 tons. A typical dually pickup (empty) weighs about 5 tons. Obviously, larger vehicles are likely too heavy to travel on LPA streets during an embargo. This may include typical UPS or FedEx delivery trucks. Hopefully, we will be able to avoid this, colder temperatures will return, and the roads will remain in good shape. If an embargo is put in place, it would be difficult to predict how long it will last, as it depends completely on the temperature, precipitation amount, timing, and type, wind, and other factors that are out of our control. Whatever plans you make for deliveries of heavy items or supplies, remember you may need to be flexible if an embargo has to be put in place. Watch for the weekly ebulletin, possible emergency bulletins, this blog and the LPA website at http://www.lakepanorama.org. The LPA will try to give as much advance notice as possible. Arrangements with the local school district will be made prior to any such announcement. Winter is the supremely quiet season at Lake Panorama. Homeowners who will be gone for extended period should make sure all deliveries are stopped, have the water shut off at the street (and shut off the valve within the home), have someone check on the home to be sure it is undisturbed and the heat is on (LPA Security can provide that service for you), and have the driveway plowed to give the impression someone is home. Light timers would also be a good idea. Driving conditions change very quickly and depend upon location. The maintenance department takes pride in clearing LPA streets in a timely manner. The variety of hills, curves and slopes mean that salt/sand treatment may vary in its effectiveness. Let us know if a slick spot remains. LPA Boaters have a new application to fill out this year. The “boat permit application” is actually geared to make each member familiar with the invasive species issue and help our Security department monitor boat traffic and inspect those vessels launching at the Marina. Be sure to read and fill out the yellow paper in your annual billing for each vessel and sign the appropriate box (es) on the reverse side. Boat permits will not be issued without a properly completed form. If you don’t know your DNR numbers for your vessels (assuming storage), the LPA staff can fill in that information for you IF the vessel was registered in 2014. Questions? Please call the office at (641) 755-2301. Every vessel will receive an invasive sticker–and must have one to launch in 2015. Things to look forward to in 2015–a new swimming pool will be available to members at the LPN. The pool is almost completed and is a joint project with the Clover Ridge TImeshare Owners actually constructing the pool. If river flow conditions permit, the Lake will be lowered over 4 feet in the fall of 2015 for routine dam and spillway maintenance. This would be a good time to inspect lakeshore rip rap and dock stability. New rules will be in effect regarding towing activities in the Narrows. Towing of tubes, skiers and wakeboards, (and any other) will be prohibited between the hours of 11 a.m. and 4 p.m on weekends and holidays during the summer. All of those once beautiful leaves are finding their way to the ground and are covering decks, drives, grass and much more. LPA members can burn them on their lots as long as burning is not done in the roadside ditches (LPA property usually) or in drainage ways. Remember, burning must be supervised and consideration of neighbors by not burning with adverse wind conditions is important. A better solution than burning might be to take leaves to the yard waste facilities. The facilities are designed to handle large quantities of yard waste. Our yard waste sites are sponsored by the Lake Panorama Rural Improvement Zone (RIZ.) The trustees of the RIZ have graciously sponsored the sites in order to make them legally available to Lake Panorama members. The Iowa DNR requires a government agency to sponsor the sites and the LPA is not such an agency on its own. Since the RIZ is our sponsor and their task is erosion control and silt management, they have required that burning not be allowed in areas that would cause possible erosion of silt into the lake. The Iowa DNR requires that burning be done in such a way as to minimize air quality issues caused by smoldering and long burning. To minimize air pollution, the LPA has prohibited root balls, stumps and logs larger than 12 inches in diameter since these items result in smoke and smoldering issues. Collections of leaves cannot be burned under DNR regulations, which is why our yard waste facilities do not burn leaves and manage them to produce compost. Please pay attention to the signs at the facility and deposit your yard waste separated into leaves and small twigs under 1/4 inch in diameter and the larger materials that will be burned. Iowa law prohibits disposal of trash, garbage, construction debris (even untreated wood pieces) (or any other item that does not grow naturally) in the yard waste facilities. Leaves can be hauled to the respective yard waste site and be dumped into the compost piles at each facility. You can leave biodegradable leaf bags with the leaves, but plastic leaf bags must be emptied and taken home with you. The facilities are not open on Mondays and Tuesdays in order for the LPA maintenance department to manage the piles, burn wood (anything greater than 1/4 inch in diameter) in the burning areas, and to keep the facilities available for the onslaught of tons of leaves that will be arriving. The gates are open from 9 a.m. to 7 p.m. Wednesdays through Sundays. The Fourth of July holiday is the busiest weekend of the Lake Panorama season. Hundreds and thousands of guests, both family and friends, descend upon our beautiful facility to celebrate. 1. Only allow experienced operators familiar with Lake Panorama to drive the boat or operate personal watercraft (PWC) over the busy weekend. 3. Be sure that all the non-swimmers wear their PFDs. Iowa law requires children under 13 to wear a PFD while the boat is under way. 4. Avoid towing tubes, skiers or wakeboards during the busiest boating times. When someone goes down or falls off, there is risk that they may not be seen in the heavy boat traffic. Heavy wave action makes riding much rougher and more likely to bounce riders off of tubes and take skiers and wakeboards down. 6. Above all, do not allow anyone who has been drinking alcoholic beverages to operate the vessel. 7. Be sure all PWC operators are 18 or over. Lake Panorama rules require PWC drivers to be at least 16, and if under 18, must have passed the boater safety course AND have the certificate in their possession. No operators can be under 16 in ANY circumstance, even if an adult is riding with them. 8. Pay attention to hazard buoys which mark an AREA of shallow water. Don’t assume the buoys only mark a particular rock or shallow. 9. Be sure to keep right of the center-line buoys in all the main lake areas. The only areas without the center-line buoys are the main basin from the Marina to Christmas Tree point and the Upper Basin at the extreme upper end of the lake. 10. During the fireworks display, keep running lights on and pay attention to directions by Lake Patrol. Speed limit after sunset is 10 mph. 11. Pay attention to the vessel’s rated capacity. Iowa law counts each passenger toward capacity, whether they are a baby or a 300 pound football lineman. Over capacity boats will be stopped, ticketed and sent to shore to unload the extras. 12. PWCs have capacity ratings and anyone being towed by a PWC counts toward the passenger rating. A PWC towing a passenger on a tube must be rated for at least three people–the driver, the observer and the tube passenger. A PWC with a 3 passenger rating with three individuals riding and one being towed is over capacity. It wouldn’t seem a little shellfish would be a safety issue, but it is an environmental issue. It and other invasive species must be kept out of Lake Panorama. Be sure you are familiar with the Lake rules requiring clean and dry boats being trailered into the lake and the invasive species registration/questionnaire required. If your boat has been in another body of water, it needs to be completely clean and all compartments dry upon inspection and had five or more days to dry since its last use. Call Lake Security ahead of your arrival to arrange for your inspection. 1. Drive carefully and observe speed limits. Watch for children who may not be aware of traffic. 2. Golf carts may be driven on lake roads, but it is not recommended during this busy weekend. ALL operators of golf carts on streets must be licensed drivers, even if a licensed driver is present. Carts are only allowed on the streets at night if they are fully equipped with headlights, tail lights, brake lights and signal lights for highway operation. 3. ATV’s are not allowed on lake roads for recreational purposes at any time. 4. Keep family vehicles off the road wherever possible. If there is absolutely no place else to park, be sure all vehicles are parked on the same side of the street and as far off the road as possible. 5. Only use fireworks legal in Iowa. Fireworks displays should have a permit from Guthrie County, safety people in place, and insurance coverage. 6. Swimming–keep everyone inside the swim ropes at the LPA beaches or within 50 feet of shore if swimming in front of lakefront properties. 11 p.m. is the designated time to shut down noisy activities. Please use consideration of your neighbors while celebrating. The important thing–Keep your family and your neighbor safe this weekend. Use common sense and look out for the other guy. Happy 4th! Celebrate our freedom to enjoy ourselves by having a safe holiday.